According to legend, the Golden Godzilla*dates back to the creation of Japan when the first gods summoned two divine beings into existence, the male Izanagi and the female Izanami, and charged them with creating the first land. The two mated and from their union were born the eight great islands of Japan. Subsequently, Izanami died giving birth to the child Kagututi (incarnation of fire). Izanagi lamented the death of Izanami and undertook a journey to Yomi the shadowy land of the dead. When he found Izanami he was unable to see her clearly in the shadowy underworld but he informed Izanagi that she could no longer return to the surface with the living. Izanagi then showed her the beautiful Golden Godzilla* that he had forged for her out of pure awesome. Seeing the indescribably beautiful gift, Izanami agreed to go back to the world above. The Golden Godzilla* then lay for hundreds of years at the bottom of Suruga Bay near Mt. Fuji until it was found in the nets of two fishermen in 1699. The chief of their village recognized the statue from the ancient texts and immediately arranged to have it sent to Edo (today's Tokyo) as the ultimate prize of Japan's first ever ball hockey tournament, The Yamato Cup. The Yamato Cup was to be played slightly over a year later in 1701. 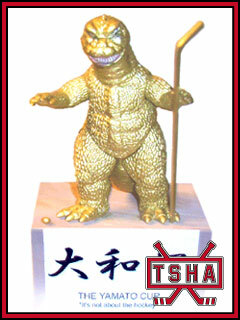 Thirteen samurai (including the goalie) were entrusted with the task of shipping the Golden Godzilla* along with a load of sacred timber (for hockey stick making) from the Shizuoka area to Tokyo. Just as the fully laden ship was rounding the Izu Peninsula it was set upon by a typhoon that threatened to sink the ship, drown all those aboard, and send the Golden Godzilla* to the depths of the Sea of Japan. The samurai, seeing that the ship would be swamped if they did not take immediate action, cut the ropes releasing the sacred hockey stick timber into the roiling seas. The nine samurai who survived (including the goalie, who to everyone's surprise, had made it despite the added burden of his pads) finally managed to get their damaged ship to port in Shimoda and travel the rest of the way to Edo (Tokyo) by foot in order deliver the Golden Godzilla*, announce the failure of their sacred mission, and commit ritual sepuku in front of the outrageously disappointed referees. Without sacred wood for the hockey sticks, Japan's first ball hockey tournament, the Yamato Cup, had to be canceled for 1701 and would not return to the national or international stage for many years to come. The Golden Godzilla* was then secretly enshrined by one of the score keepers who was by chance married to a certain Edith McCray, by remodeling his own house into a small temple in the area of Tokyo that is now known as Hibiya. Through his actions, he gave the villagers a place in which they could safely worship the Golden Godzilla* without fear of persecution of the ruling referee class. They also set the stage for a future Yamato Cup tournament when time would put sufficient spiritual and emotional distance between the sacred relic and outrageous disappointment felt by the whole Japanese referee class brought about by the failed mission of the 13 (and later nine...and still a little later 0) samurai. In 1868, following the Boshin War, the Shogunate collapsed, and a new government coalesced around the Emperor. With this new government came a rush of commercial and urban development, which, among other things, lead to the destruction of the Hamanaka family’s residence. The location of the Golden Godzilla* thus remained unknown for over three quarters of a century until a stagehand who was working at the Tokyo-based film studio Toho Co., stumbled across it while hiking in the mountains of Northern Honshu. He immediately returned to Tokyo with his newly found prize. Inspired by their colleagues finding, director Honda Ishiro used the Golden Godzilla* as the basis for the primary character of their film Godzilla, which was released theatrically in 1954. The film was such a success that 31 further Godzilla films were created. In 1994, to commemorate the 40th anniversary of the Godzilla franchise, Toho Co. erected a large, silver Godzilla statue in the Hibiya neighborhood of Tokyo, where the Hamanaka residence once stood and funded research into the history of the Golden Godzilla*. The team working on the project discovered that the Golden Godzilla had been faithfully enshrined by the Hamanaka's but no direct descendant of Koji Hamanaka could be found. Just when all seemed lost, a descendant of Koji Hamanaka's wife Edith, the daughter of a Dutch trader who visited the country in the late 17th century was later verified. Edith's roots were traced all the way back to Duncan McCray of the McCray clan in Aberdeen. Additional funding was allocated to finding any remaining descendants of Duncan McCray’s. An exhaustive search led to the discovery of several, including Mr. George McCray , one of the four founders of the Tokyo Street Hockey Association (TSHA). In 1999, after almost 3 years of legal disputes over the rightful owner of the Golden Godzilla*, George McCray won his case against a number of other members of the McCray clan. 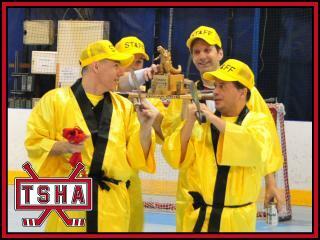 Mr. McCray gladly donated the statue to the TSHA upon his departure from Japan in 2002, on the condition that it be awarded as the grand prize to the victor of the 2008 Yamato Cup. *please note although this “Godzilla like figure” bears a remarkable resemblance to Godzilla, a giant prehistoric monster brought to life in the modern world, created in or about 1954, by the Japanese Toho corporation and motion picture studio with its principal place of business in Tokyo, Japan it is in no way intended to be mistaken for the original Godzilla or to constitute a cheap rip off by an inadequately funded amateur sports organization looking to promote its own petty interests by infringing Toho's intellectual property rights.